Do you believe that every child, regardless of their family’s income, should have the opportunity to reach their full potential? At AVANCE-Austin we are always looking for individuals and organizations willing to give their time and talents in service. We have many opportunities for the community to get involved. Listed below are some of the current ways you can help. If you don’t see an opening for your unique skill set, please contact us so we can create a special opportunity for you to support AVANCE. 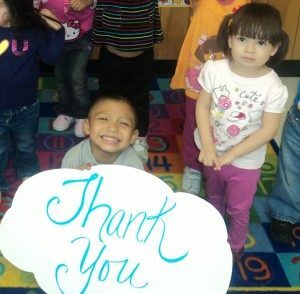 Child Classroom Aide – AVANCE-Austin offers early childhood education classes for the children in our program, Monday through Friday during 9 AM – 1 PM. As a classroom aide, you will assist our teachers with presenting lesson plans, reading to the children and other duties as required for the day. *Please note: Background check is required in advance. Volunteers under the age of 18 must be accompanied by a parent or guardian. Corporate Volunteer Partners - AVANCE-Austin’s corporate volunteer projects are enjoyable and engaging, fostering a sense of ownership in your community. In addition to making an impact, corporate volunteer projects can be valuable team-building exercises that increase brand awareness. From on or off-site volunteer projects to employee giving, there are countless ways for your organization or business to make futures so bright for more families in our community. Contact Catherine Frost or call 512-414-6125 to set up your corporate volunteering opportunity today! Toy Making Preparation – Our toy making class is one the most unique things about the AVANCE curriculum. The mothers take ordinary household items and turn them into stimulating educational toys for their children. Helping to prepare the items needed is an ongoing process, and you will work with the toy making instructor to prepare necessary materials for her classes. Special Event Help – Love to plan events? AVANCE-Austin has several events throughout the year. You can help serve food or wrap toys for the children at our Annual Holiday Party, decorate and greet families for the Graduation Ceremony in May, or assist in organizing the annual fundraising luncheon in October. Office/Clerical – Responsibilities include filing, answering the phone, data entry, and other duties as needed at our main office. Spanish/English Community Outreach – We always need people who are bilingual and knowledgeable about our services to help with interpretation/translation for outside resource speakers, and to spread the word about AVANCE, recruiting new parents to our program.Fill out our volunteer application below and we will contact you shortly.